Bacho Kiro Cave is located approximately 6 km southwest of Dryanovo. The entrance of the cave is 300 m away from the Dryanovo Monastery of Archangel Michael. 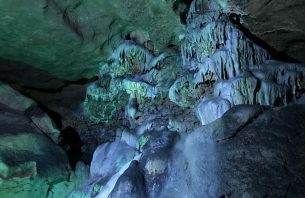 The cave is cut in a 25 m-high vertical limestone rock and is situated at an elevation of 335 m.
In 1937 it became the first developed cave in Bulgaria, and in 1940 it was named after Bacho Kiro, a revolutionary who participated in the April Uprising (1876). The cave was declared a natural landmark by Ordinance No 2810 of 10 October 1962. It is also included in the list of the 100 Tourist Sites of Bulgaria.